The Franklin's gull (Leucophaeus pipixcan) belongs to the family of gulls, terns and skimmers, Laridae. The Franklin's gull species are distributed in North and South Americas. Vagrants of these gull species have been reported from Europe, Australia, Africa, Japan and India. These gulls are monotypic species. The Franklin's gull (Leucophaeus pipixcan) is a medium-sized gull, measuring 30 to 40 cm in length and weighing 200 to 370 grams. The wingspan is 85 to 90 cm. The Franklin's gull is a common black-headed and white-bodied gull of the interior North American prairies. These species reaching sexual maturity only in the third year. These Franklin's gulls have highly distinguishable, thick, white eye-crescents, which meet behind the eye and are open in the front. There are black tips to the wings with an adjacent white band. At rest the tail tip falls between tips of primaries 6 and 7. The adult breeding gull has slaty gray upperparts. The underparts are whitish with pinkish flush. They have slaty blackish hood. The bill is medium-sized and dark red in color. The irises are blackish. The orbital ring is pinkish red. The legs are dark red. The adult wintering gull has whitish head, neck and underparts. In wintering adult much of the black hood is lost and blackish mottled half hood remains. The upperparts are slaty gray and the tail is pale gray. The rump is white. The bill and legs are blackish. In immature birds the lower hinder neck and upperparts are brownish gray and the underparts are whitish. There is a blackish mottled half hood. The sides of the neck and breast are mottled and washed brownish. The tail is pale gray with black subterminal band and white tips. The bill and legs are blackish. The Franklin's gulls make a shrill, nasal "weea..weea..weea" and "kruk..kruk..kruk" sound. The Franklin's gull species are distributed in prairies of interior North America and coastal South America. Passage migrants are found inbetween the above regions. Breeding populations of Franklin's gull are distributed in southern Canada (east Alberta, south Saskatchewan, southwest Manitoba) and northern United states of America (Montana, North Dakota, South Dakota, Minnesota and scattered populations in Wyoming, Idaho, Utah and Nevada). The passage migrants of Franklin's gulls occur in Venezuela, Colombia, Brazil, Mexico, Belize, El Salvador, Costa Rica, Paraguay, Panama, Honduras, Guatemala, Nicaragua, Sint Maarten (Netherlands), Puerto Rico (USA) and Falkland Islands. The wintering gulls of these species occur in Ecuador, Peru, Chile and Argentina. Vagrant Franklin's gulls have been observed in Australia, French Polynesia, Barbados, Bermuda, Cuba, Dominican Republic, United Kingdom, Sweden, Spain, Belgium, France, Germany, Iceland, Ireland, Japan, India, Gambia, Morocco, Zambia and South Africa. In India, "a single Franklin's gull in winter plumage was observed thrice at different times of the day on 12 November 2012 from the mouth of Chapora River at Morjim, Pernem (15°36’N, 73°44’E), in Goa (Holt et al. 2014)". The Important Bird and Biodiversity Areas (IBA) of these Franklin's gull species in Mexico are Humedales de Alvarado, Istmo de Tehuantepec-Mar Muerto, Tecolutla and The Encrucijada. 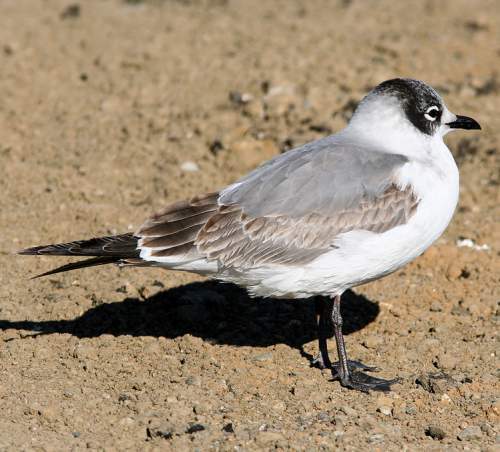 The IBA of the Franklin's gull in USA are Bear Lake National Wildlife Refuge, Bear River Bay UT02, Grays Lake National Wildlife Refuge, Market Lake Wildlife Management Area, Mud Lake Wildlife Management Area, Ogden Bay UT03 and Oxford Slough. The IBA of the Franklin's gull in Peru are Pantanos de Villa, Laguna de Ite and Estuario de Virrila. The IBA in Ecuador are Isla Española and Áreas costeras de Fernandina y del occidente de Isabela. 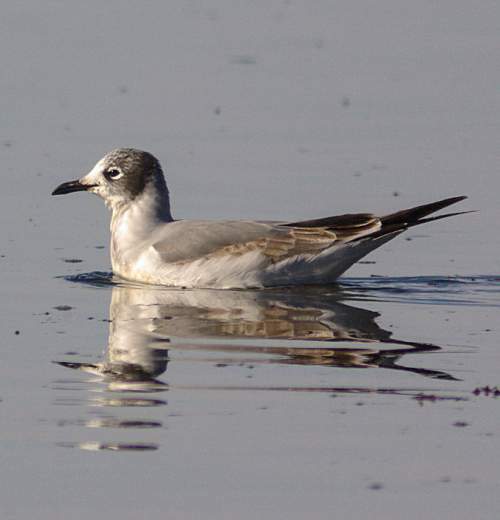 Some of the IBA of the Franklin's gull in Chile are Puerto de Arica, Playa Sur de Arica, Playa Pilolcura, Playa Colún, Isla Santa María, Bahía Rilán, Bio-bio Desembocadura, Costa sur de Arica, Estuario Lenga, Humedal de Arauco and Humedal de Batuco. Some of the IBA of the Franklin's gull in Canada are Whitewater Lake, Rice Lake, Reed Lake, Oak Lake/Plum Lakes Area, Beaverhill Lake, Blackstrap Coulee, Frank Lake, Luck Lake, Netley-Libau Marsh and Oak Hammock Marsh WMA. These Franklin's gull species do not normally occur in forest. These species normally occur in altitudes from 0 to 2500 meters. The artificial ecosystems of these species include agricultural fields and flooded pasture lands. The natural ecosystems of these Franklin's gull species include prairies, garbage dumps, intertidal mudflats, sandy, rocky, pebble and gravel shoreline, estuaries, shallow seas with macroalgal growth, wetlands, bogs, marshes, swamps, peatlands and freshwater lakes. The diet of the Franklin's gull consists mainly of earthworms. A variety of adult and larval aquatic invertebrates, terrestrial insects, worms, gastropods, small rodents, small fish, fish offal and refuse, grain and seeds are their primary food. These gull species scavenge as well as seek suitable prey. They hover over water and take the prey near the water surface. They make shallow dives to catch prey. 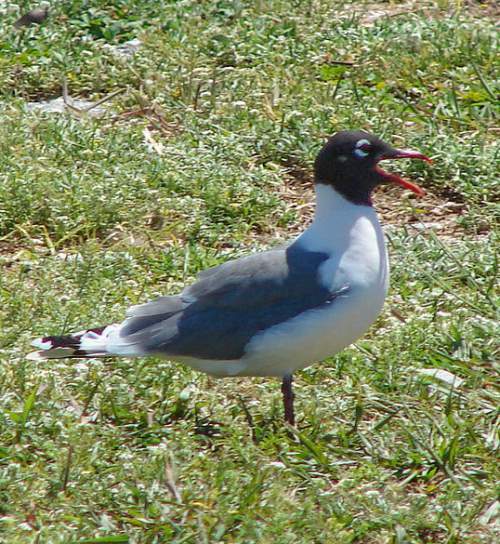 These gulls poke in wet grounds for invertebrates, especially earthworms. They scavenge at garbage dumps and fish plants. Large groups of Franklin's gull can be seen floating with the current and picking invertebrate pray. They have been observed to float for some distance and return repeatedly to the starting point to continue feeding. They also hawk airborne insects. The breeding of these Franklin's gulls is highly synchronous and the season is from May to July. They form large nesting colonies, sometimes numbering several thousand birds. They nest in freshwater marshes or along the marshy margins of lakes with emergent vegetation. The location of the Franklin's gull nests may shift annually according to the water levels. They may desert the nest if disturbed. A large number of non breeders also occur in summer in the breeding grounds, away from the core nesting areas. The nest is usually a cup-like structure made of old cattails (Typha spp.) placed on the ground or kept floating. The floating nest is anchored to the nearby emergent vegetation. The nest material is added throughout the incubation and brooding period. These Franklin's gulls are monogamous. Two to three eggs are laid in the nest of reeds. The egg is olive with dark brown and black blotches. Both the parents incubate the eggs and take care of young. The chicks hatch out in 20-25 days. The Franklin's gull hatchlings are semi-precocial. The chicks are capable of swimming shortly after hatching. Individual recognition between parents and chicks appeared a bit late. Very young vagrant chicks are sometimes taken care of by surrogate parents. The parent Franklin's gulls feed the chicks primarily with earthworms. In an undisturbed colony the chicks remained on the nest platforms until they were 25 to 30 days old. Older chicks feed themselves and fledge at 28-30 days. The Franklin's gull species are fully migratory birds. Breeding populations of Franklin's gull are distributed in southern Canada and northern United states of America. From early August these breeding populations of Franklin's gull start migrating through central America and Mexico to the Pacific coast of South America for wintering. They return to the breeding grounds in early summer (early April). The global population size of the Franklin's gull (Leucophaeus pipixcan) is estimated to number 1,000,000 to 1,500,000 mature individual birds. The overall population trend of these gull species is reported to be increasing. Throughout its range this gull species is reported to be common to rare. The generation length is 10.5 years. Its distribution size is about 2,910,000 sq.km. Habitat degradation and fragmentation, draining of wetlands and human disturbances at the nesting sites are the main threats that may endanger the survival of these gull species. The Franklin's gull (Leucophaeus pipixcan) does not approach the thresholds for being Vulnerable, either under the range size criterion, or under the population trend criterion or under the population size criterion. The IUCN (International Union for Conservation of Nature) has categorized and evaluated the gull species and has listed it as of "Least Concern". The CITES (Convention on International Trade in Endangered Species of Wild Fauna and Flora) status is ‘Not Evaluated’ for Franklin's gull (Leucophaeus pipixcan). The Franklin's gull (Leucophaeus pipixcan) is closely related to the laughing gull (Leucophaeus atricilla). The Franklin's gull is known to hybridize with grey-headed gull (Chroicocephalus cirrocephalus) and ring-billed gull (Larus delawarensis). Current topic in Birds of India: Franklin's gull - Leucophaeus pipixcan.